Premium Compatible Label Tapes for the Dymo LABELPOINT 250 printer. The Dymo Labelpoint 250 is a monochrome label printer that works on thermal transfer technology. This label printer is ideal for offices and warehouses. One can handle this label printer with one hand with ease. The Dymo Labelpoint 250 label printer can print 99 characters on a single label. This label printer has a large memory and can also be used for multiple users as it has the option of personal preference. This label printer is 0.45 kgs which makes it quite lightweight, and has a dimension of 7.4 x 4.5 x 2 inches (HxWxD). It has an LCD display of 1 line x 13 characters. This label printer facilitates multiple copying of up to 16 copies. The Dymo Labelpoint 250 label printer can print with a variety of styles and effects. Its in-built memory can save 9 printed labels, 9 favourite labels and 9 templates. This label printer has an ABCD keyboard and 56 keys are present and uses black and white Dymo Labelpoint 250 Label Tapes and offers two line printing. This label printer can print over 200 characters, 4 fonts and 70 symbols. The Dymo Labelpoint 250 laser printer works on thermal transfer technology and is ideal for offices and warehouses. This printer has low running costs due to Dymo Labelpoint 250 Label Tapes. This label printer has a large memory and can be used by multiple users. It can print a large variety of characters, fonts and symbols. Multiple copying is also possible with this device. This printer lacks a QWERTY keyboard and the size of the labels it handles is quite small. Q. What type of the Dymo Labelpoint 250 Label Tapes does the printer support? What media sizes can the label tape have? A. The type of label tapes that the printer supports are flexible nylon tape, permanent polyester tape, self-adhesive label tape. The Dymo Labelpoint 250 Label Tape can have 0.23 inches, 0.35 inches and 0.47 inches of length. Q. What should I do if the error message ‘Poor Print Quality’ is getting displayed? A. If the error message ‘Poor Print Quality’ is getting displayed, then follow these steps to resolve it. Replace the discharged batteries or attach a power adapter. Also, ensure that the label cassette is installed properly. Even if the problem persists, clean the printhead and then replace the label cassette. Q. What are the advantages of using Dymo Labelpoint 250 Label printer? Q. If the error message ‘No display’ is getting displayed, what should I do? A. If the error message ‘No Display’ is getting displayed, ensure that the label printer is turned on. If the batteries are running low then replace them. 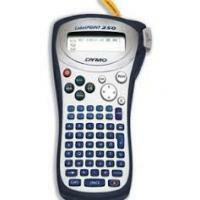 Q. I have got faulty Dymo Labelpoint 250 Label Tapes. What is the policy of returning them? A. If within 30 days of purchase, an item fails to operate then you can contact us. The replacement or refund is given to you once the item has been returned to us and tested. Q. What are the disadvantages of using the Dymo Labelpoint 250 Label printer? Q. The error message ‘Insert Tape Cassette’ is getting displayed. Why? A. If the error message ‘Insert Tape Cassette’ is getting displayed, then the Dymo Labelpoint 250 Label Tape is either empty or missing. So, replace it with a new one. Q. Am I informed about the delivery of the Dymo Labelpoint 250 Label Tapes from time to time? A. Yes, you are informed regarding the delivery of these label taps from time to time through email. You can easily track your order. Q. What is the design of the Dymo Labelpoint 250 Label Writer? How does it look like? A. The Label printer is housed in black and silver and it has a sleek, modern and ergonomic design for easy handling. This label printer has colour-coded buttons and an ABCD keyboard. It has an LCD display, function buttons, a manual cutter and a battery compartment for 6 batteries. The tape cassette compartment can handle Dymo Labelpoint 250 label tapes as wide as 6, 9 and 12mm. Q. I ordered the wrong Dymo Labelpoint 250 Label Tapes. I wish to return them. What is the policy for returning them? A. In case you have ordered the incorrect tapes ones and you have to return them, please contact us within 30 days of purchase. The non-faulty label tapes must be returned unused, in their original undamaged packaging and in a re-saleable condition. We'll exchange the tape or give you a refund by placing a credit on your account. All such returns are subject to a 10% restocking charge.